Meet the Gallagher’s. A family living down and out in Chicago’s West side, where unemployment is high, and expectations are low. 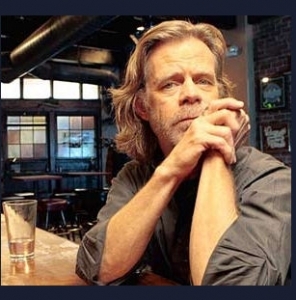 The patriarch, Frank Gallagher (played by William H Macy) is cheating the government out of disability insurance and drinking every drop while his family struggle day to day just to stay housed and fed. His eight kids have learned to become self sufficient as a result of their father’s neglect, watched over by the oldest daughter "Fiona Gallagher" played masterfully by Emmy Rossum. The new Showtime series "Shameless" has all the elements of a tragic comedy and the players deliver their characters with ease. What makes Shameless so believable is that many people can identify with some portion of the Gallagher collage. Be an Uncle, a Mother, a cousin or a friend. Characters include the smart talking oldest son “Lip” who cons and steals in order to get his brothers and sisters money and food. Or “Ian” who is in the closet about his homosexuality while attending ROTC, and carrying on an affair with his married convenience store boss. There are so many levels to shameless it is impossible to list them, but watching them pony up money for heat or water down the milk for breakfast is a glimpse into the real underbelly of neglect. But it is also about diversity and adaptability as the Gallagher kids overcome the obstacles that their father has perpetuated through his alcoholic denial. And though Frank Gallagher is a despicable deadbeat single parent-who leaves very little to be desired-Macy breathes life into the character making you want to like him-even though you shouldn’t.Why is that? Perhaps it is the cross town rants, or the way the kids circle him protectively when an outsider is critical. Whatever the reason Shameless is a first rate made for cable television series with an ensemble cast of actors who make being dysfunctional hilarious and yes, a little sad as well.